Home >> ROYAL TITLE REGISTRY - SALE! THE ULTIMATE ROYAL GIFT! NOW HALF PRICE! Royal Title Registration offers you a unique opportunity to give a "Royal Title" to yourself or someone else! Guaranteeing a place in royal history! The Royal Registry is quickly becoming a real "Who's Who" in the "World's Kingdom of Royalty." 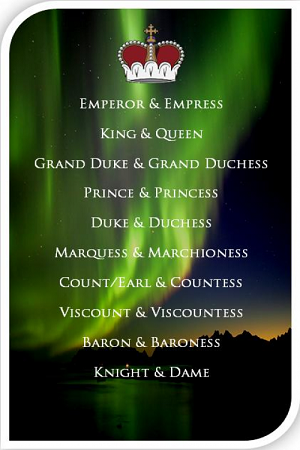 Since 2000, we have given official "Royal Titles" to hundreds of individuals worldwide. So, whether it is to honor a family member, a "Royal Title" makes a unique and welcome gift. The Royal Registry's $49.95 NOW HALF-OFF! gift package includes a beautiful, frame-able, 11" x 14" full-color certificate in calligraphy. It is printed on parchment, personalized with name and "Royal Title" of your choice, and dedication date. It also comes with a letter of congratulations.